The lemmings have apparently had an argument of something or another, and they’re ready to fight about it. 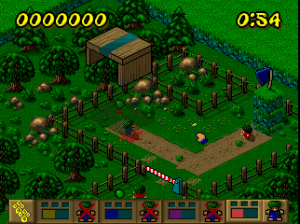 Unlike that other group of small, squeaky voiced animals from the UK with a penchant for exploding (see: Worms), however, the lemmings are settling their differences through a friendly game of paintball. Well, mostly friendly. The giant pits of flame doesn’t help. That’s probably not the actual story, but the game doesn’t really give one anyway. The game is split rather unevenly between the four traditional Lemmings difficulties, for a total of 102 levels. 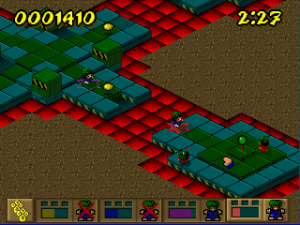 In each level, you’re given a squad of one to four lemmings, and your objective is to have each lemming reach the blue flags. Some levels have only one flag, and others can have up to four. 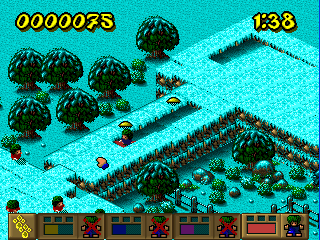 Of course, there’s still hazards to deal with, and not only that, now you’ve got a whole team of other lemmings aiming to shoot you down. Unlike the previous games in the series, which were puzzle games with hints of action elements, Paintball is more of an action game with hints of puzzle elements. 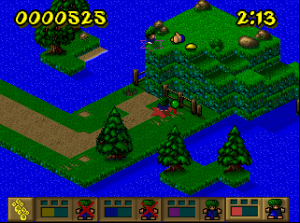 Instead of a side-scrolling view, you see everything from an isometric view. 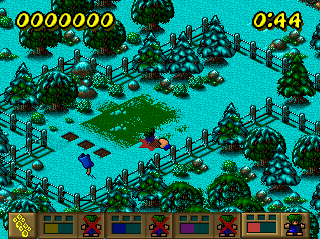 And while the object of the game is still to get lemmings to a goal, the way you do that is completely different. For the first time in the series, you have direct control of your lemmings. 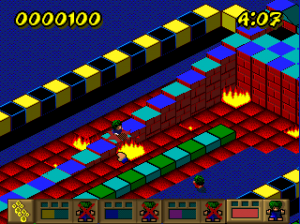 Clicking the left mouse button will make a lemming move towards the spot you click, and the right mouse button will make him fire paint towards the direction you click. You can also have multiple lemmings selected at once to make them move and fire as a group, or deselect some of them to have one or two go off solo. Having a more involved hand in your lemming’s destiny is pretty nice, but the problem is that the pathfinding is a little wonky if you don’t tell your lemming to move in a straight line. They’re still lemmings, of course, so if you’re not careful, they’ll dump themselves right off the edges of things, where they can get stuck or die. This is especially bad if you’re controlling more than one lemming, since the ones following your lead character are even worse at not falling off of things. The levels are pretty straightforward with the move of genres. There’s still a few things to mess with, like trampolines that bounce your lemmings forward, keys to open locked gates, and moving platforms among other things. 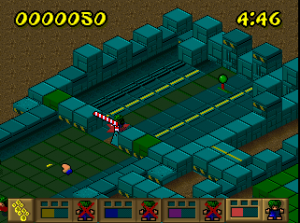 The focus is more on shooting things now, although the later levels have plenty of pretty challenging puzzles. 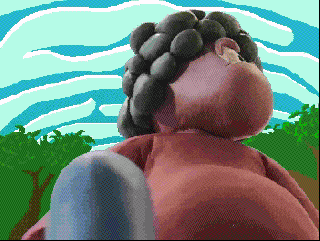 Since you’re controlling more than one lemmming, a lot of levels involve using one lemming to activate a switch so another lemming can cross an obstacle. The combat itself is a bit frustrating, sadly. 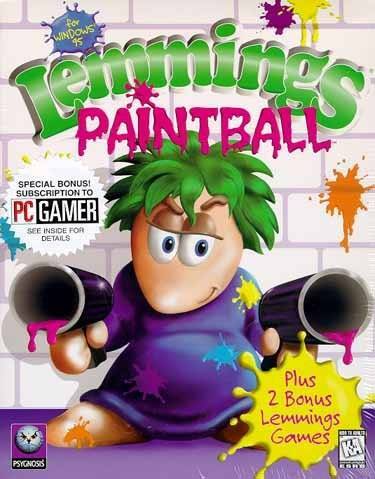 Your lemmings aren’t really great shots, and it can take a few shots before whatever you’re trying to hit actually gets hit, and each lemming only has so much paint to shoot with. The enemy lemmings are pretty stupid, too, and usually won’t actually attack you unless you get too close to them, which means you can pick some of them off at a distance if you’re careful. They are, however, much better shots than your lemmings, and there are times when they’ll be able to shoot one of them as soon as he catches sight of your lemmings. Since each lemming can only take one hit before they’re removed from play, this can get frustrating pretty quickly. (To be fair, it probably takes forever to wash paint out of all that hair.) If you’re on a level that requires teamwork or has more than one flag to collect, you’re basically screwed and in need of a restart. The real problem with the game is that it just gets repetitive quickly. 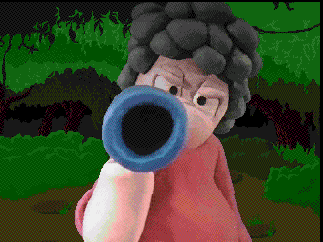 There are no other weapons for your lemmings to use besides the standard gun, and no real power-ups besides one for extra time. 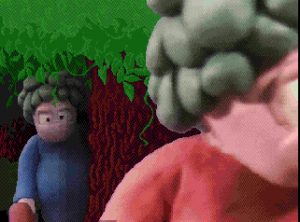 The only enemy you’ll ever actually fight is the same lemming, the entire game. And even the puzzles get monotonous with how few things there are to interact with. The most annoying thing of all is that the game uses a password system to keep track of progress. Really, passwords? 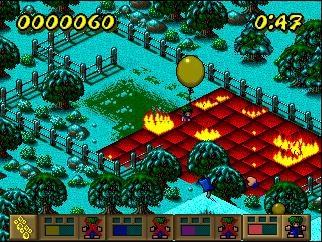 There have been dozens of OSes less powerful than Windows 95, many of which could save games just fine. What kind of excuse could there possibly be, when every Lemmings game since Lemmings 2 let you save your game? There’s also a two player multiplayer mode, but good luck getting that going on modern computers. The graphics are fairly decent, if kind of bland. 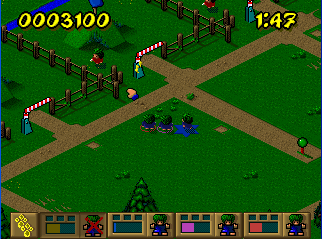 The lemmings sprites are nicely animated, if a bit pixellated. 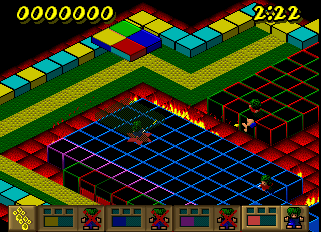 The problem is that some of the level themes are pretty ugly to look at, including one that’s nothing but a bunch of multi-colored floor tiles. This wouldn’t be as much of a problem if there weren’t about four or so level themes, each of which repeat VERY frequently. Of course, they tended to repeat in every Lemmings game, to be fair, but not quite to this extent. The sound is average at best, except for the overdramatic orchestral sting that plays every time you fail a level. The MIDI music is decent, even though there’s only a few tracks that play during gameplay, which also gets very repetitive. The best thing about the game’s presentation would have to be the claymation intro, which depicts two lemmings getting into a Mexican standoff with paintguns. 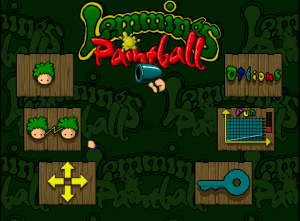 Overall, while it’s not exactly bad, Lemmings Paintball isn’t really all that great. While the concept’s pretty interesting, and having a game where you can actually control what your lemmings do for once is nice, it’s got a lot of issues. The shooting doesn’t always work out, controlling your lemmings is a pain, sometimes, and there’s just so much repetition. If you’re really interested in the concept of a Lemmings RTS, your best bet is something like Gruntz.